A four-year starter in football at Tucson High School, Mike was All-State in football and wrestling. He received All-American recognition at THS and was an Arizona wrestling champion in his division in 1972. Mike was also a four-year letterman at the University of Arizona, where he was one of the best linemen in school history. Mike was named All-Conference in football at the U of A in 1974 and 1975. In 1975 he was WAC Lineman of the Year, Outstanding UA Lineman in 1974 and 1975, and named to the AP All-American College Team. Dawson was a first-round draft choice by the NFL St. Louis Cardinals in 1976 after sparking his UA team to a 9-2 record. He was the second UA player ever drafted in the first round. He played in three post-season College All-Star Games, including the Shrine East-West game. Mike was named the UA Hall of Fame for his outstanding defensive football abilities. In nine NFL years (he played a total of 10) he played 113 games and started 91. 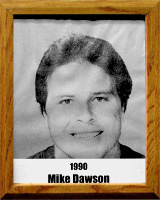 Mike is the brother of Pima Country Sports Hall of Famer Bill Dawson.